The 9th Annual International Conference on Genetic Genealogy sponsored by Family Tree DNA for their project administrators will take place in Houston, TX beginning Friday, November 8th and lasting through Sunday, the 10th. I’ll be attending this one, just like I’ve been at every conference since the beginning. There aren’t many of us who attended that first conference and are still attending, and fewer still who have attended all 9 conferences. You can see some photos of that first conference and a few stats here. Charles Kerchner brought his freshly minted haplogroup pins to sell, R1b for Yline and H for mito. My – how things have changed. Today I wrote a report for a man who is R1b1a2a1a1b4h. Although Charles is now retired from genetic genealogy, I’m sure if he still has some pins, he’d love to unload them, er, I mean, sell you one. In the genetic genealogy world, they are antiques now, but we were surely excited to proudly wear them in 2004. They were kind of the 2004 DNA version of “what’s your sign?” Everyone was walking around the hotel lobby around looking for other people wearing pins! 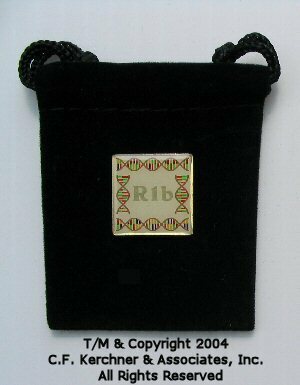 I still have mine and my haplogroup J mito pin too. The first conference was a landmark, watershed, event. We were giddy with excitement to attend the conference and meet each other for the first time, face to face. Sadly, some of those friends are no longer with us. Looking back, I recall how different things were, and how much they have changed in just under a decade. Most notably, there was no Facebook, no Twitter, no forums and no blogs. The first DNA books for genealogy were introduced that year, as was Mitosearch, and Sorenson released their first data base information. Back then, the best you could hope for if you couldn’t attend the conference, which was the ONLY educational opportunity for genetic genealogy, was that someone would post on the Rootsweb DNA list about what was taking place. There was no ISOGG list, as ISOGG hadn’t been formed yet and wouldn’t be for another year. Today, ISOGG has 8000 international members. Speaking of Rootsweb, which was the primary message system at that time, DNA was a taboo subject on the surname and location lists and boards. Actually, it was prohibited everyplace on Rootsweb except for lists like the genealogy-DNA list which had been formed specifically to discuss DNA. I never understood exactly why, but the topic of DNA was treated like a social disease. You couldn’t discuss it, you couldn’t talk about results and you most assuredly could NOT recruit people, even discretely. Messages that even smelled remotely like they might be DNA related were routinely deleted. It seems to me that there was a great amount of fear that DNA might unearth truths that some people didn’t want unearthed or maybe that using DNA was somehow “cheating”. And indeed, it has revealed many truths. The truth is the truth and refusing to talk about it didn’t save anyone. We knew a few years later when one of the biggest opponents said they ordered a DNA test that we had won that battle, although we were a bit shell-shocked. The whole thing seems archaic today and almost unimaginable. Now, of course, we post about DNA on all of the electronic forums and most genealogists can’t imagine NOT having DNA available as a tool. Like many others, I’ve had brick walls fall that could never have met their demise any other way. Unfortunately, the forums like Rootsweb and Genforum are much less popular today and have in many ways been usurped by Facebook. I find that unfortunate, because the Rootsweb boards and lists were meant to be searched and permanent archives were a built in feature. Ever try to find something someone posted on your Facebook timeline a few weeks later? Good luck with that. Last year at the conference, I tweeted, as did several others. I won’t be doing that this year. I discovered that different tools (PC, MAC, iPad and iPhone) react and interact differently with Twitter and trying to work through those issues was both frustrating and distracting. This year, instead, I will TRY to blog each day at least briefly about what occurred. We’ll see how that goes. I tried to blog on my private family blog when I was overseas earlier this year too, and that did not go well for a multitude of reasons. This year at the conference, I’m speaking as well during one of the breakout sessions. My session is titled, “How to Find Your Indian Prince(ss) Without Having to Kiss Too Many Frogs.” Unfortunately, Tim Janzen is speaking about Autosomal Mapping at the same time. I think lots of people will want to attend both of these sessions, and both do deal with using autosomal DNA as a tool. Autosomal is only a part of my presentation however. Family Tree DNA is also providing Roundtable Discussions and I’ll be monitoring, moderating or hostessing (whatever the appropriate term) 2 separate tables, one on Saturday and one on Sunday for Y-SNPs and Mitochondrial DNA, respectively, along with other volunteers. For those attending, I’ll see you on Friday at the reception. For those who will be waiting for information, hopefully I’ll be blogging something on Friday evening after the reception if there is anything to report. The sessions don’t actually begin until Saturday morning. Check your Twitter feeds and Facebook for other information posted by other attendees throughout the day. The conference schedule is here. It’s always wonderful to see my genetic genealogy friends and cousins once again, so safe journey and see you in Houston!!! This entry was posted in Autosomal, Conference, Education, Native American and tagged Historical or Obsolete by Roberta Estes. Bookmark the permalink. Have more clues at Ancestry now. I want to thank Dr. Ann Turner, who originally founded the DNA-Genralogy Forum. For a long time she was the source for most of the information about DNA. I took my first test in 2000 when I first tested with Sorenson. Later that year I ordrd my kit No 368 from what would become FTDNA. Congrats also to Bennet Greenspan for all his hard work in founding his company. Good writeup Roberta. Sometimes an older member of a family group that is interested in genealogy, puts up with certain things. But they KNOW something happened within their own memory, that is “best kept secret”…. Hence the reluctance. As we older people die off, the more interested younger generation starts research, and is shocked to find out that they carry the DNA of a neighbor, perhaps 80 years ago. I also think that much of this is the result of farm communities, especially in England. “adopting” neighbors children when the parents died, perhaps from fires, mining/ farm accidents, smallpox etc. I have personally run into this myself, my parents refusing to give me any family information, then finding I match four other family groups of the same surname ( not mine) Now we have found someone with MY surname, that is a closer match to this other family, than to me , the same surname as the third party… So……the families were apparently neighbors in Yorkshire, perhaps over centuries, maybe the SAME family BEFORE surnames. Excellent write up!! Wish I could be there, but circumstances conspired against that. I will look forward to your blogs. Roberta, looking forward to your news from the conference. Last year, after I got our Y and mt haplogroups from Geno 2 for my Dad and myself, I ordered those pins from Charles Kerchner. I got an appropriate one for all my family members, plus one for a friend who had done Geno 2 at the same time. They are neat, and at least I wear mine when I go mix with any genealogy friends (can’t say if anyone else in my family wears theirs, though – that’s how it goes). Mr. Kerchner still seems to be offering the pins on his website: http://www.kerchner.com/dnapins/dnapin.htm, if anyone is interested. They are actually really nice pins and come in that nifty little black bag. And even if you are R1b1a2a1a1b4h, you are at the root, R1b, so they still apply. You’re a really good speaker and funny too! It seems too long since you’ve spoken at an FTDNA conference so I’m looking forward to your talk Bobbi! Roberta, does FTDNA have anything similar for non-administrators? For those of us just seeking to learn as much as we can on genetic genealogy. They do provide webinars, but they don’t have anything in conference format. Mark, admins can take a guest, so ask your admins…someone may have a spot they could let you go in in the future. I typically send a post out to my groups asking if anyone is interested in attending with me. The more knowledgeable group members the more productive the group. You are very bright and very capable Mark and you’ll be just fine. That project would be a good “cut your teeth project. Look forward to reading the posts. Megan is at Pensacola, FL this weekend and I look forward to seeing her speak. Have a great weekend. Thks. for all you do for genetic genealogy! Megan is a wonderful speaker. I make it a point to attend her sessions whenever I can, regardless of the topic. I would LOVE to hear Megan speak! I was in Pensacola last weekend..shucks! Where can I find out when/where she is speaking for future reference please? Thx!